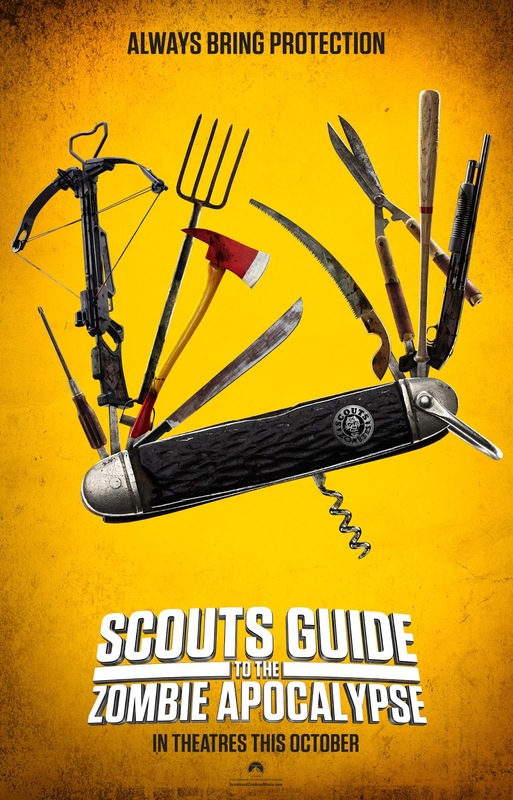 It's hard to figure out who exactly Scouts Guide to the Zombie Apocalypse was made for. While initially seeming like something aimed at the kiddes for the Halloween season it is now abundantly clear that is not the case as we have our first real look at the film (previously titled Scouts vs Zombies) via a very red-band trailer. While this is probably the more financially responsible choice (do live action kids movies make money anymore? Of course, if the budgets are small enough) I still don't know exactly who is going to see this beyond the crowd who enjoy horror/comedies, but how big could that fan base be? Otherwise, this thing is slated on a "holiday" weekend where the weekend before will see five new major releases including a Bradley Cooper movie, a Vin Diesel movie, a Bill Murray movie, another Paranormal Activity flick and Jem and the Holograms. In essence, the previous weekend will hit a wide array of demographics and I imagine most general movie goers will decide to opt out of the theater experience the next weekend given Halloween falls on a Saturday this year and Goosebumps and Crimson Peak will have opened two weeks prior satisfying anyone's urge for horror or horror/comedy. The only way Paramount will get something out of this seems to be through their new distribution plan or if it somehow becomes something of a cult favorite after hitting home video. All of that aside, the trailer has it's moments that at least feel inspired in terms of telling another zombie movie in a familiar way, but I can't say I'm really excited to see if it holds up against all it has going against it. Who knows, maybe it'll surprise. Scouts Guide to the Zombie Apocalypse stars Halston Sage, Tye Sheridan, Logan Miller, Joey Morgan, David Koechner, Patrick Schwarzegger and opens on October 30th. Synopsis: Three scouts and lifelong friends join forces with one badass cocktail waitress to become the world’s most unlikely team of heroes. When their peaceful town is ravaged by a zombie invasion, they’ll fight for the badge of a lifetime and put their scouting skills to the test to save mankind from the undead.